Horns blaze across the Eastern Kingdoms, calling the Alliance to arms. 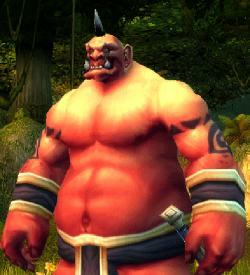 The drums of Durotar hasten the Horde to prepare for the looming conflict ahead. Glorious battles, prized treasures and dominion over all of Azeroth are on the table! Heroes will be made. Legends will be written. Heed the Call! Upper Deck Entertainment is producing a collectible card game based on the World of Warcraft MMORPG. As with other CCGs, each player will construct a deck of cards from the available edition cards. Each player controls a hero, with the cards representing equipment, abilities, allies, and quests. The object of the game is to defeat the other player heroes. 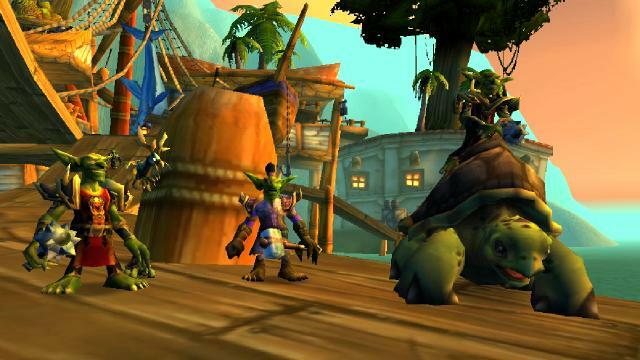 The importance of WoW:TCG to online players is that some in-game items will be coming from the card game. These items are all cosmetic (“vanity”) items only and thus should not impact in-game play. These items come in two forms: Loot cards and UDE Point cards. Loot cards are rare variants of normal cards (and can be used in the game just like their normal equivalent). These cards include a code that can be entered online for gear. Each booster pack also comes with a UDE Point card, which has a code that can be entered at the Upper Deck Entertainment website for 100 UDE points. 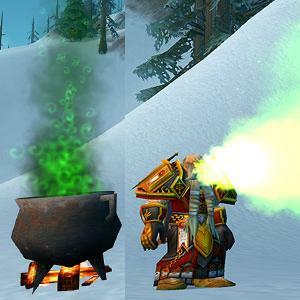 UDE points can be saved and spent on a variety of UDE products, including WoW:TCG game accessories, clothing, and promotions for other UDE products. There will also be some in-game items that can be purchased with UDE points. These items are provided by Landro Longshot, located on the docks of Booty Bay near the Old Port Authority mall. You will need to provide him the item code (either from the Loot card or the UDE web site) to obtain your item. 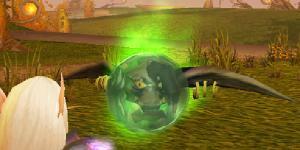 A hippogryph hatchling vanity pet comes with the 280. 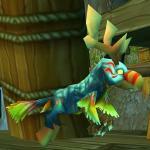 Thunderhead Hippogryph rare variant. These are allegedly seeded at 1 card per case of boosters (1 per 288 packs). A special red Tabard of Flame comes from the 278. Landro Longshot variant card. These are seeded at ~3 per case (1 per 96 packs). A Riding Turtle comes from the 279. Saltwater Snapjaw variant card. 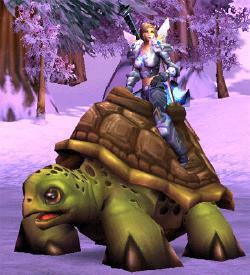 This is a cosmetic mount only (no speed benefit – hey, it’s a turtle after all), able to be used by any level of character without riding skill. These are seeded at 1 per 2 cases (1 per 576 packs). Booster Packs each include 15 random cards (1 hero, 10 common cards, 3 uncommon, and 1 rare). Individual packs list for $3.99, a box of 24 packs for $93.99, or a case of 12 boxes for $999. Starter Decks include a base deck of 31 cards (including 1 hero card) built for one of the nine character classes, 2 UDE point cards (100 points each), 3 oversized hero cards, and 2 booster packs. Decks list for $14.99 each or a box of 6 for $89.99. 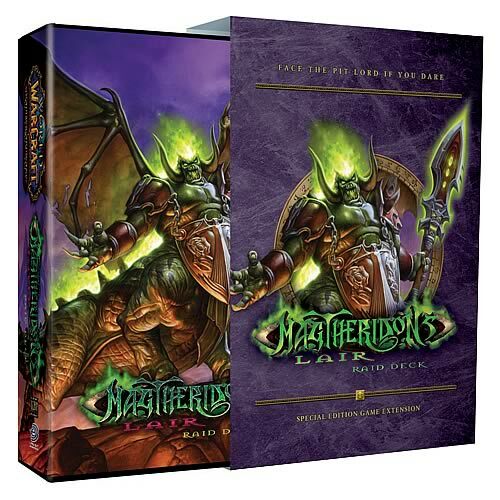 The Burning Crusade Collector’s Edition included 2 starter decks and 3 tournament-legal exclusive cards. The second installment of the Trading Card Game, The Dark Portal extends the storyline to match the content of the Burning Crusade expansion. 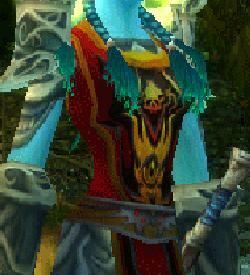 Included in this edition are the draenei and blood elves, as well as additional content related to the expansion. This expansion adds another 319 cards and contains enough content that you could play without the initial edition. As with HoA, this edition is available in Starter Decks ($14.99), Boxes ($95.99), and individual Booster Packs ($3.99). New in this edition are three more Loot cards. The Loot variant of the 244. 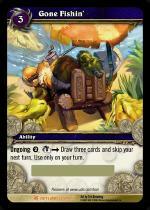 King Mukla ally card provides a Banana Charm that allows you to summon Bananas, an adorable baby gorilla. These are allegedly seeded at 1 card per case of boosters (1 per 288 packs). The Picnic Basket from the Loot variant of the 148. Rest and Relaxation ability card opens up into a full picnic setup, complete with umbrella (got to love the pineapple pattern), blanket, and portable grill. 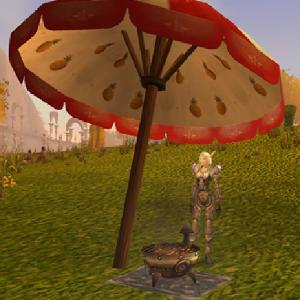 The grill can be clicked on by any passerby to get a yummy Grilled Picnic Treat (“Tastes great – does nothing!”). The seeding rate for these is allegedly 3 per case (1 per 96 packs). For those who would like to know the future, just ask your magic Imp in a Ball, supplied from the Loot variant of the 143. Fortune Telling ability card. Oops – reply hazy…ask again later! These are seeded at 1 per 2 cases (1 per 576 packs). This is the next installment of trading card packs. This set will build on the initial Dark Portal set with new adventures and challenges in the shattered world of Outland. The Loot variant of the Goblin Gumbo card allows the aspiring chef to summon a Goblin Gumbeaux Kettle, allowing anyone in the summoner’s party to claim one of the 5 helpings of Goblin Gumbeaux. The gumbo is tradable and persists until log out (so it isn’t auctionable). Eating the gumbo causes the player to occasional burp a cloud of green gas for five minutes, much like the Fire Festival brew, but grosser. A Fishing Chair, complete with umbrella and cooler, awaits those who find the variant of the Gone Fishin’ card (seeded at 1 per case). 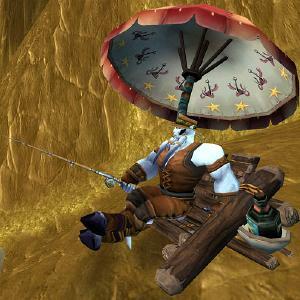 Coordinated with the Picnic Blanket set up from the Dark Portal set, the Fishing Chair provides a deployable in-game chair that your character can sit in while fishing (no fishing ability bonus; just comfort). 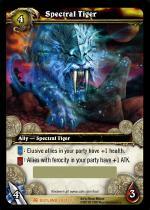 The rarest of the Loot cards for this edition (seeded at 1 per 2 cases) is the variant of the Spectral Tiger card. 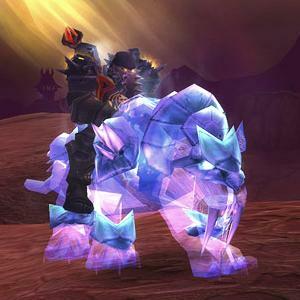 This allows the lucky owner to purchase a Spectral Tiger mount (standard or swift). The appropriate riding skill is required as well as the purchase price (10g/100g – the same as racial mounts). 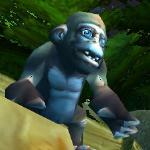 Once unlocked, you may purchase the mount at any time (so you could buy the normal one at L40 and the swift at L60). From his seat upon the Throne of Kil’jaeden, Doom Lord Kazzak commands all to look upon the fourth installment of the trading card game. 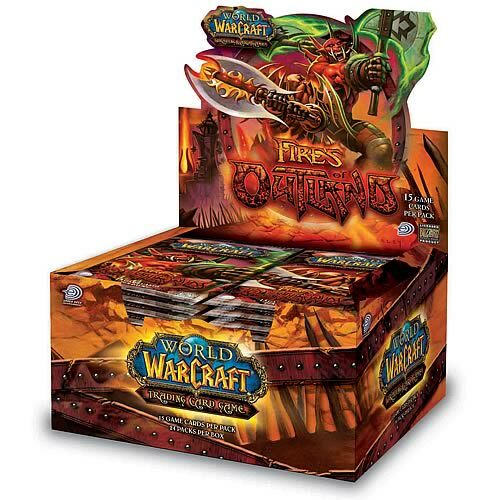 Offered in Starter Deck and Booster Pack format, this continues to develop the challenges of the Burning Legion as well as the battles between Horde and Alliance in the new frontier. This is the first limited edition scenario (“raid”) deck, released in late November 2006. Raid decks have one player taking the role of the instance and its final boss, while other players cooperate against the boss. The expansion adds 110 scenario cards for the raid itself (2 copies each of the 30 non-hero cards in the Onyxia Raid deck, 30 Onyxia Event cards, 20 Onyxia Whelp tokens), a 10-card Treasure Pack (containing up to 10 of the 33-card Onyxia deck, with (allegedly) a greater possibility of rare Loot cards), and 3 oversized Onyxia hero cards (for the three stages of the encounter). The expansion lists for $29.99. This is the second limited edition raid deck, adding another 110 scenario cards and a 10-card Treasure Pack. 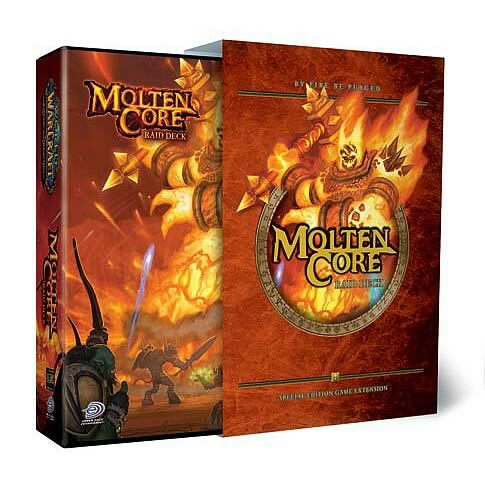 The expansion is tentatively listed at $29.99 and slated for a May 2007 release. Expected in November 2007 (just in time for the holidays! ), Magtheridon’s Lair challenges adventurers to face the nefarious Pit Lord. Another 110-card raid deck and 10 treasure cards await those who dare. PC Gamer, Holiday Issue 2006 (Issue 156), includes Onyxia 7. 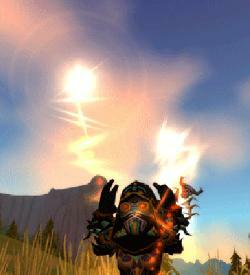 Sunfire (Druid Ability). Maximum PC, December 2006 (Vol. 11, No. 13), includes Onyxia 4. Natural Alignment (Shaman Ability). GamePro, January 2007 (Issue 220), includes Onyxia 5. Shelter the Flock (Priest Ability). Beckett Massive Online Gamer, December 2006/January 2007 (Vol. 1, No. 4), includes Onyxia 2. Coordinated Attack (Hunter Ability). Games for Windows, January 2007 (Issue 02), includes Onyxia 6. Spread the Word (Paladin Ability). 1 Nimaasus the Implacable 29 A Draenei Paladin Mining, Jewelcrafting Retribution (3), Flip Nimaasus => Nimaasus deals X holy damage to target ally, where X is the amount of damage that ally dealt to Nimaasus this turn. 2 Varanis Bitterstar 25 H Blood Elf Mage Enchanting, Jewelcrafting Arcane (4), Flip Varanis Battlestar => Varanis deals 2 arcane damage to target hero or ally. Draw a card. Use only on your turn. 3 Through the Dark Portal During your turn, pay (13) to complete this quest. Reward: Remove your deck and graveyard from the game. Build a new ten-card deck using cards from your entire collection. UDE Points are redeemed at the UDE Points site. This site includes promotions for all of Upper Deck Entertainment’s products. 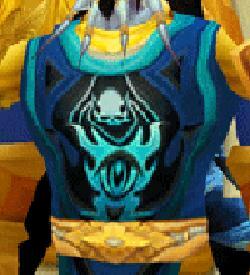 2,000 UDE Points can be traded for an exclusive blue-patterned Tabard of Frost. 10,000 UDE Points will buy a Perpetual Purple Firework, a reusable trinket that allows you to set off a unique fireworks display. 25,000 UDE Points give you this Carved Ogre Idol that allows you to take on the appearance of a purple ogre (including emotes – you can dance like an ogre!). Currently, you can also buy computer wallpapers for 100 UDE Points, UDE deck case sleeves for 200 UDE Points, and screensavers for 500 UDE Points.